8 Foods Rich in Biotin (B7) | Eat This! Biotin (B7) is important for the processing of sugars, fats and amino acids. It is also known as the “hair vitamin” and is beneficial for hair growth. There is not an official RDA for biotin but research suggests that 30 mcg per day is an appropriate amount for the average adult. Eggs are traditionally recognized as a good source of biotin but there is a molecule in egg whites which prevents the absorption of the vitamin from the egg yolk. Here are 8 foods rich in biotin. Shelled peanuts contain about 100 mg of biotin per cup. Almonds contain about 90 mcg per cup. Semi-sweet chocolate contains about 32 mcg per 100 gram bar. Swiss chard contains about 10.5 mcg per cup. Tomatoes contain about 7.5 mcg per cup. Yogurt contains about 7.4 mcg per cup. Eggs contain 7-15 mcg per egg. 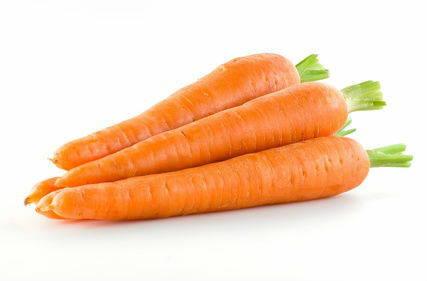 Carrots contains about 6 mcg per cup. Not getting enough biotin from food or want to take a bit extra for better hair health? Check out the 5 Best Biotin Supplements according to user reviews.